Once an evil king called as Kamsa was ruling the Mathura (a part in North India). His people were mercilessly tortured by him. Everyone prayed to the the Lord Vishnu who assured that he would soon be born on earth to kill the evil king. Meanwhile Kamsa was making arrangements for his sister Devaki's wedding with Vasudeva. On the day of Kamsa's sister Devaki's marriage, a voice from the sky was heard. The voice said that Devaki's 8th son would kill the evil king Kamsa. This frightened Kamsa and he immediately took his sword to kill Devaki. Her husband Vasudeva fell on Kamsa's legs and implored kamsa to spare his wife. Vasudeva promised that he would hand over every new born child to Kamsa. Kamsa agreed for this and ordered his men to out Vasudeva and Devaki in the prison.When Devaki and Vasudeva had their first child, Kamsa came to the prison and slaughtered the innocent child. Like this he went on killing the next new born sons also. When Devaki and Vasudeva were waiting for their 8th son, one night Lord Vishnu appeared in front of them in that prison cell and said that he will be born as their 8th son and the child will be called as Krishna. He asked Vasudeva to carry the new born child after the birth, to Vasudeva's friend Nanda's house at Gokula. Vasudeva was to exchange his boy with the Nanda's new girl child and return back to the prison. At midnight, the 8th son was born in the prison cell. Vasudeva, remembered the instructions of Lord Vishnu took the child in his hands and prayed. The prison doors opened up and he started his trip to Nanda's home. 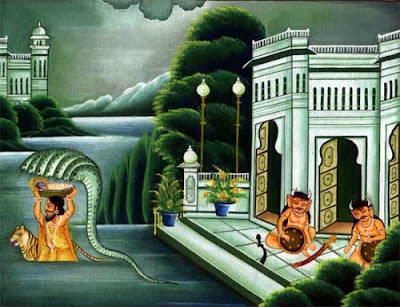 On the way when crossing the river Yamuna, it was raining heavily, but miraculously a five-headed snake followed him from behind and provided a safe shelter or the little baby. Vasudeva reached Gokula and exchanged the kids as the Lord had instructed and returned back to the cell with Nanda's new born daughter. When Kamsa came to know about the birth of their 8th child, he rushed to the cell and tried to kill the little girl. But the little girl jumped out of his hands and trasnformed into a Goddess. She said, "O foolish Kamsa! Your destroyer is already safe in another place. very soon he would come and kill you". She then dissappeared into the sky. Later after some years, Krishna who grows up at Gokula kills the evil king Kamsa as the Lord Vishnu had assured earlier. He then sets his parents Vasudeva and Devaki free.